Floatbrella is one of Perry's abilities in Super Princess Peach. 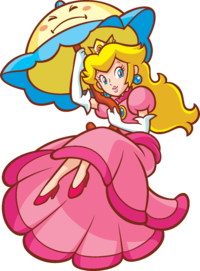 Its name is a portmanteau of float and umbrella, and it allows Princess Peach to float in the air for a few seconds. It can be purchased in the shop for 200 coins and is notable for being identical to Princess Peach's Floating Jump ability from Super Mario Bros. 2.